Seating Masters offers a wide selection of stylish, well-built and affordable patio tables that are sure to make your outdoor seating area a success. We have patio tables to fit any budget and an array of styles that you can match to your decor. Our outdoor patio furniture is built to withstand the rigors of everyday use in a commercial environment and maintain its beauty in harsh outdoor conditions. Seating Masters' Stainless Steel Patio Table Tops are perfect for outdoor use in restaurant patio seating areas and also great for indoor casual dining. 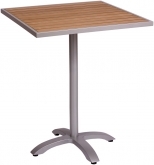 We also offer matching chrome table bases which are ideal for both our square and round varieties of Stainless Steel Table Tops. 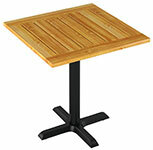 Whether you prefer stainless steel, teak or Werzalit, we have a patio table to fit your establishment. If you're not sure which patio table is best for your venue you can consult with our knowledgeable and experienced customer service representatives. We can also help you determine which of our patio chairs best matches the patio tables of your choice.